Innovation - Metri-Tech Engineering, Inc.
Metri-Tech is Making Waves in Huntington Beach! The bed feels extra warm and cozy at 5:00 am on a Friday morning, but he must get up, the day is waiting on him. At fifteen years-old, a surfer’s life is much like that of a grown adult in some ways. He must rise early, while it’s still dark and cold outside, because there is work to be done. So, he quickly dresses, grabs a snack from the kitchen, and hurries to collect all the items he will need for the day. A businessman may grab his briefcase and a laptop computer, while the surfer collects his surfboard and wetsuit, but the process and intentions are very similar. What is it about a young surfer’s life that makes it sounds like he has it easy? We often hear parents and relatives say things like “enjoy it now, because these are the best days of your life.” But, the reality is, he gets up early to surf, then he has seven hours of school, two and a half hours of soccer practice, and a couple hours of homework to finish off the day. That sounds like a long list of responsibilities, not much different than adults would contend with. The real reason why some are envious of that young surfer’s life, even though he continuously chooses to wake early and brave those cold and powerful waves knowing he has a long day of work ahead of him, is because he’s doing what he loves and has a passion for. It is the pursuit of that perfect wave, that perfect day, that perfect life that we are all searching for. That is what most people are missing from their lives as they grow older and start taking on “responsibilities.” At some point, the responsibilities outweigh the passion, and doing the things we love seems to fall out of reach. A recent Gallup Poll suggests that only 24% of employees worldwide are “engaged” with their job. 47% of employees are likely to look for a new job in the next year; 31% are extremely or very likely, according to Aflac. Saba reports that 1 in 3 workers will change jobs in the next 5 months. It is safe to say that only a very small portion of the population enjoys the work they do, and that having a passion for ones’ job is truly a rare phenomenon. But, I find myself questioning that assumption because we have so many of those “rare” people here at Metri-Tech Engineering, Inc. How can this be a rare phenomenon, if it appears to be so normal and common within the friendly confines of a small manufacturing company in Huntington Beach, California? However, the statistics don’t lie, and that is precisely what makes Metri-Tech such an amazing organization. Collectively, we all truly care about the work we’re doing. We feel like we’re making a difference in the world, and it shows in the exceptional quality we produce. It starts at the top with Hans and Kathi Gratzer and the passion they have for their business, coupled with the kindness they show to their employees. That enthusiasm has seamlessly passed on to their son, Hans Gratzer Jr., and, like a contagion, it continues to manifest and grow amongst the managers, supervisors, and employees of the company as well. Metri-Tech is truly a family affair, and I find it refreshing and invigorating to work for a company where the word “team” almost doesn’t feel good enough to describe the whole. Metri-Tech employees may not be surfing every day, but we are pursuing our collective passion, and we’re making our own waves in the process (both figuratively and literally). From the smooth surface finishes of our high precision impeller products to the introduction of new mobile robots and automated machining systems, Metri-Tech continues to make waves throughout the industry. We are extremely excited to announce our most recent company acquisition, the Matsurra LX-160, an Ultra High Precision Vertical Linear Motor Machine. This milling machine is the ultimate 5-axis vertical machining center, equipped with fast and accurate linear motors in all axes for machining with high-speed and high-precision. We are aggressively pursuing automation as an efficient, cost effective way to increase shop capacity and better serve our customers. 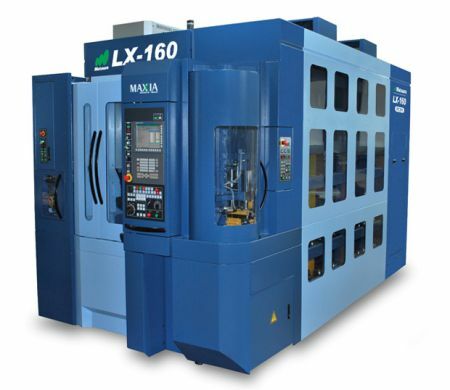 The Matsuura LX-160 has exceptionally fast cutting speeds up to 46,000 RPM. In addition, the machine has a 338 tool magazine, 42 pallets and a collision avoidance system for the ultimate in unattended machining. Each pallet can be loaded with different parts and placed in queue to produce a variety of fully completed parts, autonomously, 24 hrs a day, 7 days per week. We are proud to be the first company on the West coast with this state-of- the-art high speed machining center, providing our customers with additional capacity for high precision machined components in very short lead times. If your requirement consists of blisks, impellers or blades (our type of waves!) out of Inconel, titanium or aluminum – we can help. All of us here at here at Metri-Tech Engineering wake each and every morning in search of another perfect wave. Metri-Tech would like to introduce a new addition to our family of “State-of-the-Art” machines – The Matsuura 5 axis LX-160 a 42 pallet, full 5 axis linear motor machining center.